Please come protect me from the grilling I will receive from investigative reporter, Mitch Malone, the main character in W.S.Gager's mystery series. He is a sharp guy and will try to make me squeal on the answer to the mystery in Sunshine Boulevard...who is killing the seniors on Sunshine Boulevard? Please leave a comment on this blog or W S Gager blog to be eligible to win a FREE copy of Sunshine Boulevard. Thanks! 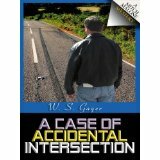 Check out W S Gager books at Oak Tree Press or at amazon.com.